The Durham Red Multi, manufactured by Wienerberger at their Todhills works, is a machine made stock brick, red in colour with a lighted creased face. A 100% recyclable high quality facing brick. If you require any quantity other than 500, please contact us where we'll be happy to see what we can do. We can arrange for samples of this brick to be sent. Please use the 'contact us' link at the top of this page to send us your details. 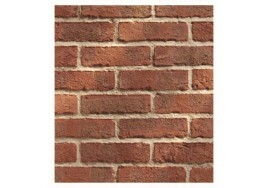 As brick stocks are constantly changing, please contact us to check availability. For full details of delivery charges, returns, colour variations, and discounts please see our delivery & returns policy.